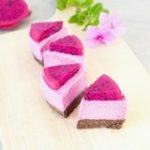 Raw vegan cheesecake recipe | no baking required! Do you like cheesecakes? I love them since they are so creamy and delicious. 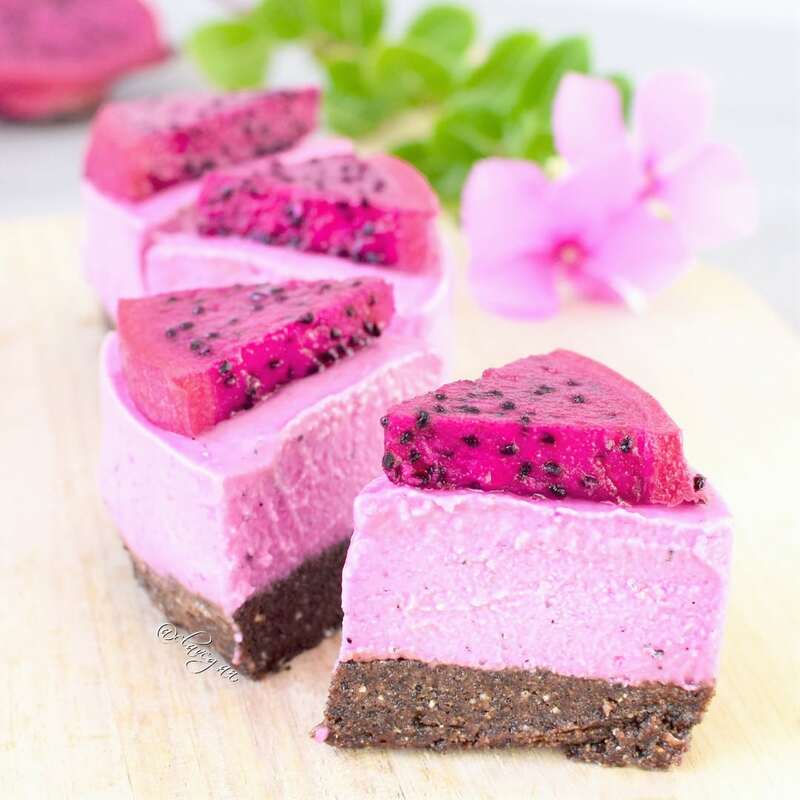 This raw vegan cheesecake recipe is dairy free, egg free, refined sugar-free, gluten free, plant-based, fruity, light and would be a great treat for the summer. It doesn’t contain any cholesterol like non-vegan cheesecakes and it requires no baking. Big bonus in my opinion! 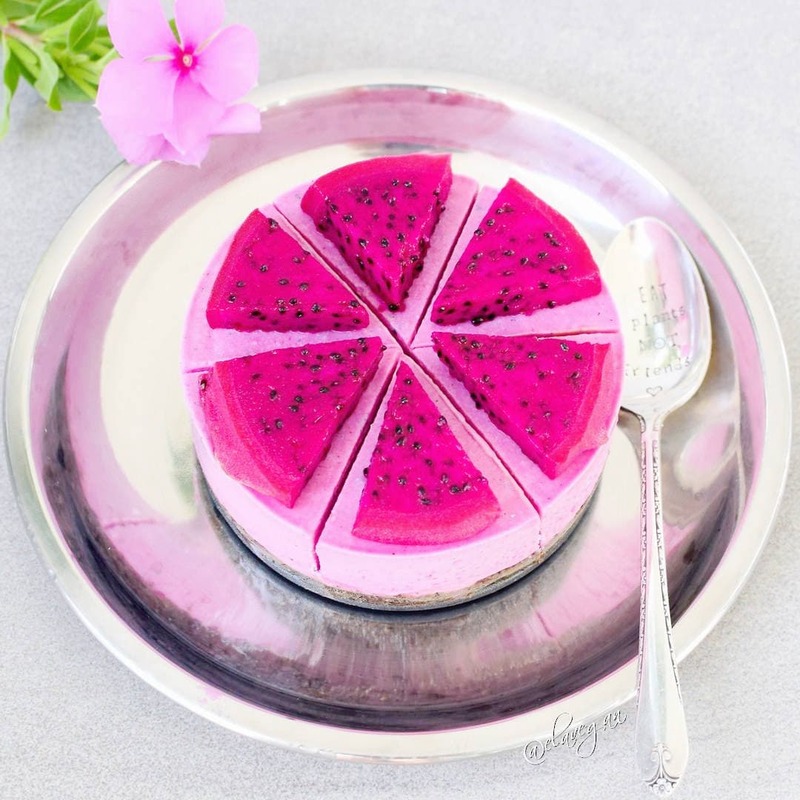 I used pink dragon fruit to naturally color the cheesecake pink because pink makes everything prettier and it’s furthermore the perfect color for Valentine’s Day. It would be also a great cake for a birthday party, especially for girls. The base contains prunes, buckwheat groats, poppy seeds and xylitol. Below you will find some facts about these ingredients. Xylitol is made from birch trees, but unlike sugar, it is not converted in the mouth to acids that cause tooth decay. It can actually even prevent cavities! I really like the taste, it’s sweet and it produces a noticeable cooling sensation while it melts in the mouth. Did you know that poppy seeds are very high in copper, calcium and especially in manganese? For instance, 1 tablespoon (9 grams) of poppy seeds has 33% of the RDI of manganese, 16% of the RDI of copper and 13% of the RDI of calcium. It’s also high in phosphorus and zinc (2). Dried prunes are an excellent source of healthy fiber, vitamin K, copper, manganese, potassium, as well as magnesium. For the cream, I used cashews, coconut cream, xylitol and furthermore a slice of a pink dragon fruit. It turned out very creamy, smooth and delicious. You can substitute for pine nuts or macadamia nuts if you don’t want to use cashews. I hope you will enjoy my recipe. If you try it out please leave a comment below and/or tag me in your Instagram or Facebook post with @elavegan and #elavegan so that I can see it and leave a comment. 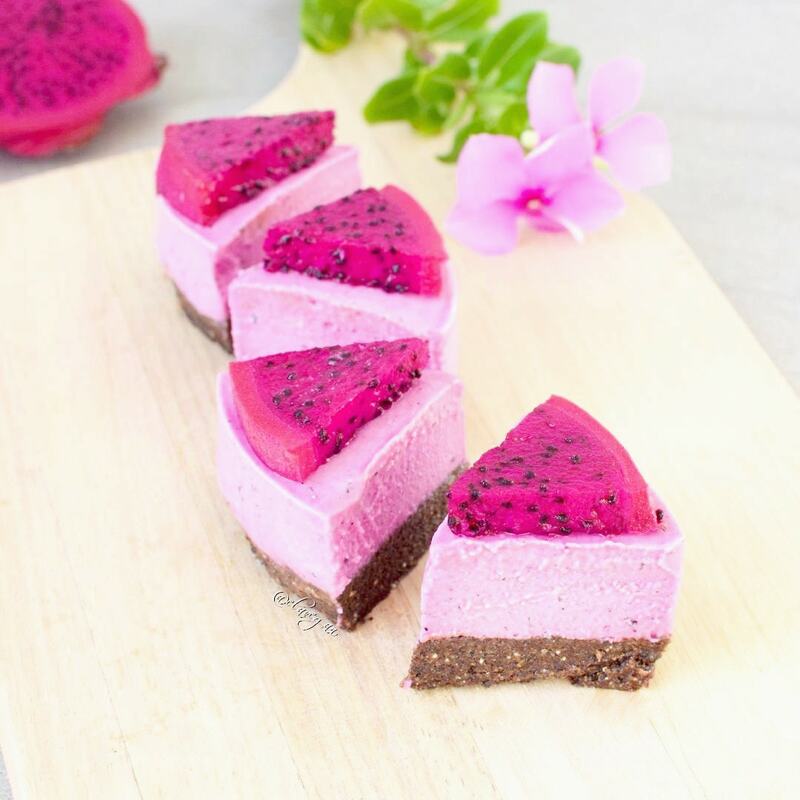 This raw vegan cheesecake recipe is easy to make, it's gluten free, plant-based delicious and pink!